Less than 2 days later, a few of the roses are looking droopy. The next day a few more follow suit. You think to yourself “it’s the thought that counts”, and do your best to not be disappointed. If you’re like I am, this has been your experience with long stemmed red roses at Valentines. I know the florist does everything she can to ensure the roses arrive at their best, but so much happens along the trip from the rose farms in Ecuador to the vase on your dining room table that it’s no wonder some of your buds wilt before they bloom. I’m no expert (it’s still early days wearing my florist hat), but I’ve come up with my own ways to lengthen the life of my lovely Valentines roses. I will share some of my strategy in the recipe in this post, and at the end of the post I will also share some of the expert tips and tricks I’ve learned to help your roses last. Speaking of this post, it is by far the longest one I have ever written, but there was so much to share, I simply couldn’t edit it down to a quick 2 minute read. So pour yourself a cup of tea or a glass of wine and find a comfy corner with your laptop and enjoy learning some cool stuff about The Rose. I love roses! I especially love the dark red velvet textured Black Magic roses. But give me roses of any size and colour and I will be happy. Hybrid tea roses, garden roses, sweetheart roses, spray roses – all in hues that represent most of the colour wheel. Roses are also loved by most of the female population of the world and are considered to be the most favoured of all flowers. Personally, I think any woman who says she doesn’t like roses is only saying that because it’s such a popular flower, and she doesn’t want to be associated with the status quo. In my opinion, women are simply genetically predisposed to being attracted to roses. As the world’s favourite flower, it was estimated that the number of roses produced for Valentine’s Day (the number one holiday for florists) in 2006 was 189 million stems. Of those roses purchased, over 60 percent were red. The passion for the rose dates back to the beginning of civilization and there is fossil evidence that this flora predates the evolution of the human. In the interest of offering you just enough information to intrigue friends and family at your next get together, I’ve condensed my rose research to a list of choice bits. Based on fossil evidence, the rose is 35 million years old. Discoveries of tombs in Egypt have revealed wreaths made with flowers, with roses among them. During the rule of the Roman Empire, roses became synonymous with excess. Peasants were forced to grow roses instead of food crops. Emperors filled their baths and fountains with rosewater and used rose petals as carpets for their feasts and as confetti during celebrations. In Greek mythology, Chloris the goddess of flowers created the rose. She enlisted the help of Aphrodite the goddess of love, and Dionysus the god of wine to help her revive the lifeless body of a beautiful nymph. She then enlisted the three Graces who gave charm, brightness and joy, and Apollo the sun god who shone down and brought this newly created flower into bloom as the first rose. In ancient Hindu legend Brahm, the creator of the world, and Vishnu, the protector of the world argued over which was more beautiful – the lotus or the rose. Brahma believed the lotus was more beautiful until he saw the rose, at which point he instantly changed his mind. As a reward he created a bride for Vishnu from 108 large and 1008 small rose petals. Her name was Lakshmi. Whenever a secret meeting was held, the Greeks used roses to decorate the ceilings of their conference rooms. This indicated that everything discussed was confidential. This was the origin of the expression “sub rosa” which means literally “under the rose” or “something told in secret”. War of the Roses represented a time during the fifteenth century when two factions, York and Lancaster were fighting for control of England. Each used the rose as a symbol. The white rose represented York, the red rose symbolized Lancaster. The winner of this war, Tudor Henry VII, merged his Lancastrian rose with the red rose of his York bride and thus created the Tudor Rose, the Rose of England. Roses were in such high demand during the seventeenth century that royalty considered roses or rose water as legal tender, and they were often used as barter and payment. Napoleon’s wife Josephine loved roses so much she established an extensive collection at Chateau de Malmaison, an estate seven miles west of Paris. This garden of more than 250 rose varieties became the setting for Redotue’s famous watercolour collection called “Les Rose”. The world’s oldest living rose bush is thought to be 1,000 years old. Today, it continues to bloom on the wall of the Hildesheim Cathedral in Germany. It has been estimated that 150 million rose plants are purchased by gardeners worldwide every year. In the cut flower industry, the rose dominates with annual crops calculated in tons. The time between cutting a rose from rose farms in Ecuador and being recut for a Valentines bouquet can be as little as 48 hours. Until 2008, the cut rose industry in Canada (centred in southern BC, the Niagara region in Ontario and southern Quebec) was a thriving multi-million dollar industry. With the continued improvement in pricing and diversity and quality of the flower, Ecuador and Columbia have become the preferred source for cut roses. Our romantic symbol of the red rose first came from China around 1800. Send a secret sentiment of affection with your choice of colour for your gift of roses. Here is a list of the meanings associated with the colour of the rose. Red: The ultimate symbol of romantic love and enduring passion. The red rose also conveys respect and the creative spirit of love. Representing true love stronger than thorns, the red rose is known universally as the lover’s rose. Valentine’s Day would hardly exist without this bold and dramatic bloom. Yellow: While in Victorian times, the yellow rose symbolized jealousy. Today it represents friendship, joy and caring. A bouquet of yellow roses conveys warmth, gladness and affection. Pink: Symbolizing gentility, femininity, elegance and refinement, the pink rose also carries additional meanings depending on its hue. A deep pink conveys gratitude and appreciation, while pale shades connote grace and gentleness, admiration and happiness. Orange: With their warm, vibrant tones, orange roses symbolize enthusiasm and desire. A beautiful expression of admiration and attraction, a bouquet of orange roses also includes an underlying message of passion and excitement. Purple: Thought to be almost mystical in nature, with symbolism tied to enchantment, desire and even proceeding cautiously, it’s not surprising that purple roses send a message of love at first sight. If your roses have drooped, read Martha Stewart’s tips below the recipe. Then try my suggestion for lengthening the life of a dozen roses by creating 2 separate arrangements – one bouquet and one vignette using a series of vases. Fill all vases half way with water treated with floral food. 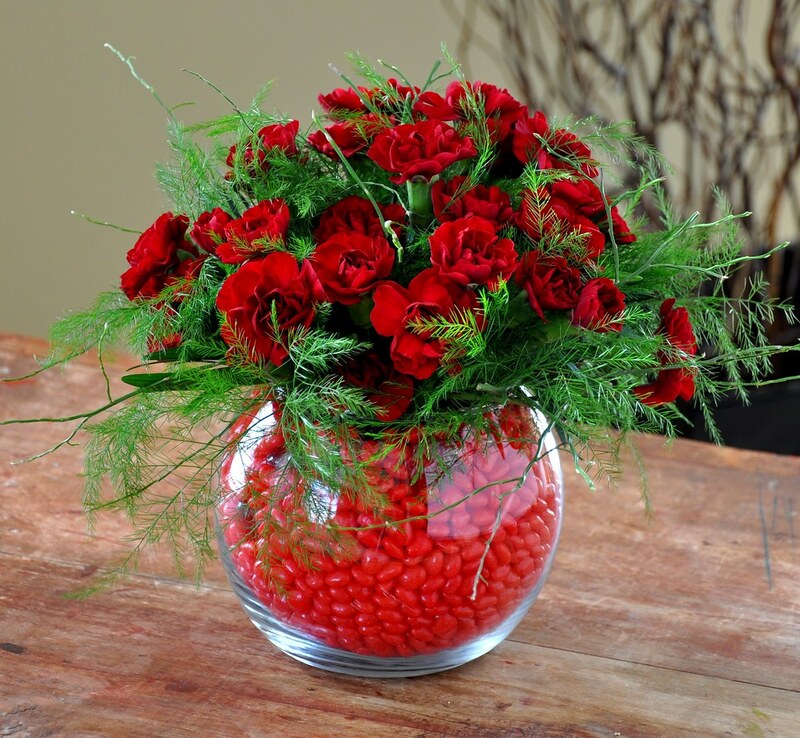 Cluster together 7 – 9 roses so they create a domed shape. Surround with alternating stems of baby`s breath and tiki. Tie the bunch just under the flower heads with string or tape. Trim the stems so the rose heads rest over the edge of the vase. No need to worry about the heads drooping. 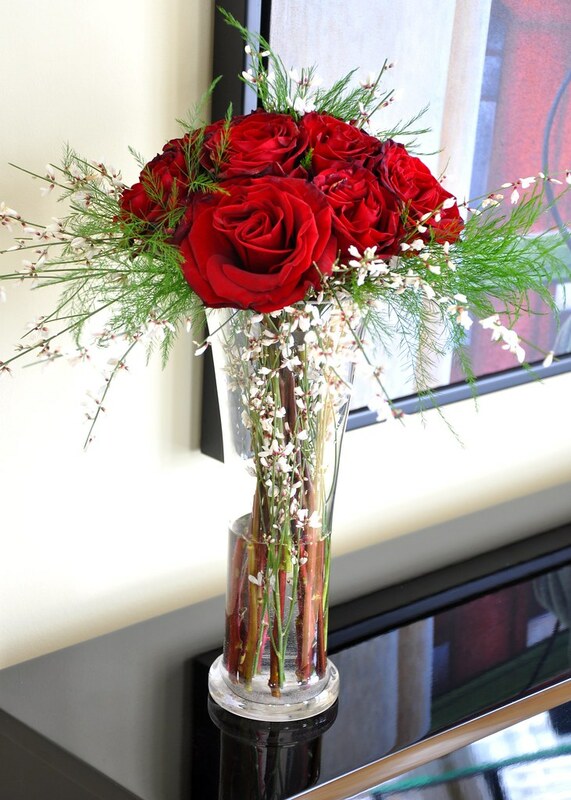 To camouflage stems, tuck some tiki or baby`s breath into the vase just under the flower heads. 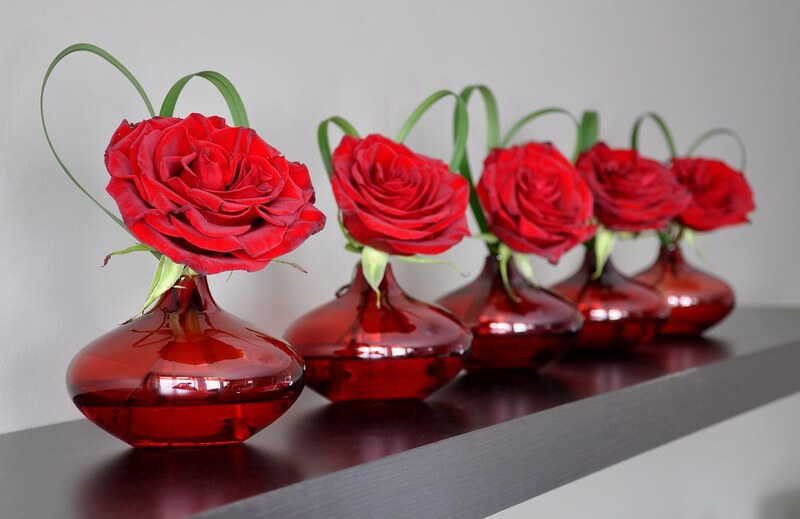 Cut the remaining 3 – 5 roses quite short so the heads sit about 1 inch beyond the edge of the vase. Curve 2 pieces of grass and tuck in behind the rose heads so they resemble the shape of a heart. When the roses are cut this short, they can last much longer than long stemmed roses, especially if you change the water regularly. For an elegant, impactful presentation position the vases in a row along a mantle or along the centre of a dining table. The tall vase makes a nice accompaniment on the coffee table or sideboard. To condition the roses, trim the bottom of each stem at a sharp angle (keeping the stem underwater, if possible), which exposes the surface area exposed to water. Wrap them in paper, and stand them in a bucket of cool water that contains flower food; let them rest for a couple of hours. This will ensure that the blossom heads do not droop. If your roses are wilting, give them a bath. By submerging your roses in a cool-water bath, the pores will absorb water, helping them to plump and revive. Removing browning petals from around the outside of the flower head and frequent re-cutting of the stems can further prolong your arrangement. Originally my next flower was supposed to be the carnation, January`s birth flower. But suddenly it was almost Valentine`s Day and it was essential that I instead write about the rose. I hope you’ve learned something interesting and fun about this floral symbol of love. For the carnation lovers among you, here is a fun little arrangement below for Valentines using mini carnations and cinnamon hearts. Let me know if you would like the recipe. This entry was posted in Uncategorized, Valentine's Day and tagged blooms, dozen red roses, florist, garden roses, hybrid tea roses, magic roses, red roses, Roses, spray roses, sweetheart roses, valentine's day. Bookmark the permalink. Both comments and trackbacks are currently closed. great information and creativity!! Thanks for the inspiration!